What a Fun Time at Stamping Around! Wow - what a fun weekend I just had! 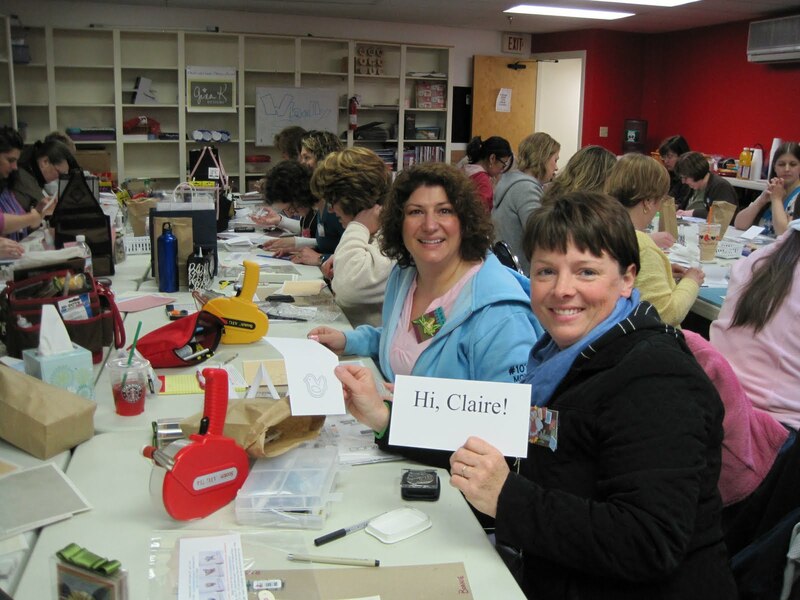 I was teaching one of the classes at Stamping Around held at Wholly Scrap! in North Hampton, NH. And here's what we made! 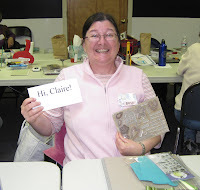 My class was sponsored by Claire of Waltzingmouse Stamps (Thank you Claire!) 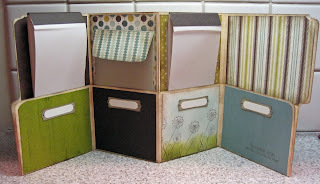 and we used this beautiful Sewing Box Hugs set for our cards. Six lucky participants won this set after we made our cards - whoo hoo!! here are three of them saying "hi" to Claire! 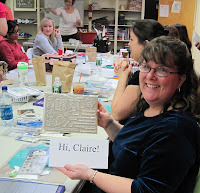 We used the Paper Tole technique, stamping the images several times on different colors of Claire's own digital patterned papers, cutting out each layer, and adhering them over each other using foam dimensionals. 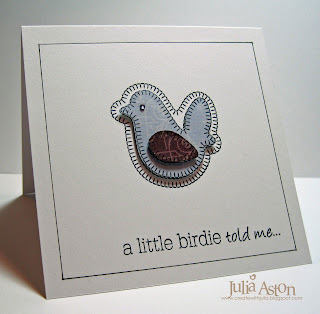 For the bird above, we stamped the image first directly on the card and then layered the bird and wing over the stamping. The outlines were made using a Micron 01 fine tip black marker drawing a line 1/4" in on all sides. These are all 4 1/4" x 4 1/4" square cards. On this heart card we added a twine bow and a little heart sticky gem by Amuse. This set is full of wonderful sentiments that coordinate with the images. And with the stamped outline stitches - people are going to think you are a wiz with your sewing machine because it looks like real stitching doesn't it!?! 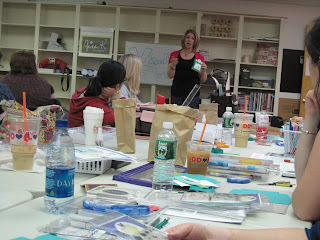 Our first class on Friday night was taught by Donna Cecere. (Hi GF!!) 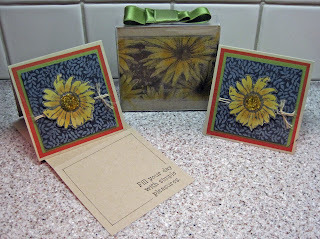 Her project was this lovely set of 3 cards tucked inside a stamped clear box. We stamped on the box with black Staz On Ink then colored the image from the inside of the box with Copics. We colored the flowers stamped on Kraft CS with Copics, cut them out layered them on panels and added stickles and Glossy Accents to the centers. Very cute huh!?!? Here's Donna on the front left and Julie Masse (one of the organizer's) on the front right. 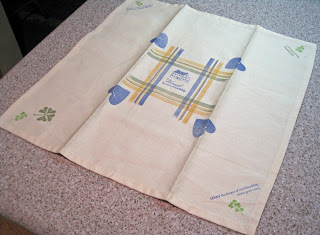 The third person on the left here with the blue top - is Sandy from Epping, NH - and she gave me this wonderful stamped linen that she made using Waltzingmouse Stamps - isn't it wonderful??? thank you SO much Sandy!!! Lauren Meader's project was one of her not yet released templates - and we each got the stamp set we used for this project. Whoo hoo! Check her store to see all her wonderful stamps, templates and digital stuff!! Isn't this a super gift package?!? After a delicious lunch of specialty deli sandwiches, popovers, sugared walnut, mixed greens salad and little pastries (Yum!!!) 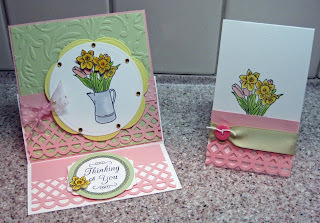 Monika Davis inspired us with a pretty spring easel card and matching magnetic bookmark (these are popping up everywhere aren't they?? wink wink - see Fridays post!) We used Just Rite stamps and a Martha Stewart punch on this project. Below is Monika sitting at the front table just prior to starting her class. Julie Masse and Kim Schofield are giving away more prizes that were generously donated by several sponsoring companies. 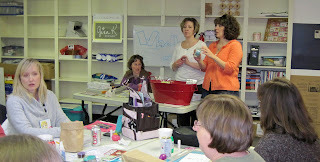 For the last class of the weekend - Cindy Lawrence taught us how to make this terrific file folder organizer. The stamp set we used is Dandy Days by Our Craft Lounge. The papers are My Mind's Eye/Little Boy Blue. Look at all the fun sections on this! Can you believe it's made by folding a regular manila file folder!! Here's Cindy holding one of the WMS Sewing Box Hugs sets that she was lucky enough to win! 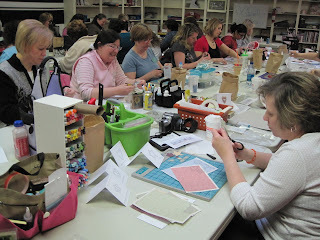 Now don't you wish you had come to Stamping Around??? WMS March Release DT Blog Hop! 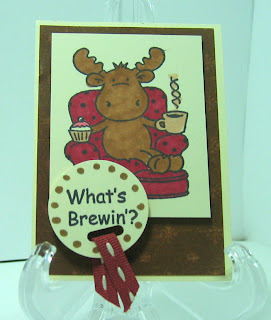 Welcome to the Waltzingmouse Stamps DT blog hop for the March 1 new release! Claire has 3 wonderful new sets to excite and inspire you available TODAY!!! - Labels 3, Roses and Nestie Eggs! I'm honored to be highlighting two of the new sets on my cards today. Labels Three and Roses. You should start the hop at our Claire's. If you came here from Bonnie - you're in the right place and you're almost done with the hop! For my first card I used the beautiful Labels Three set that fits the Nestabilities of the same name (do you think that was planned?? LOL!!) I stamped the scrolly label inside the dotted label and colored in the scrolls with a Copic. The sentiment, daffodils, butterflies and dots are from last months release Spring Baskets. 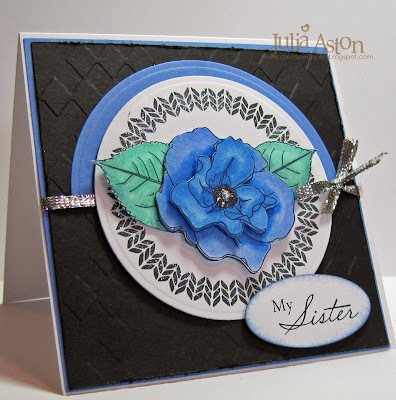 I also used the beautiful new Victorian Digi paper as the background of my card. Claire has 3 different digi papers premiering today - so be sure to check them out too! I used Taylor's sketch for this card. The Inspiration Challenge on Split Coast was to pick an Olympic Ice Skaters costume to inspire our card. I was inspired by this beautiful blue, black and silver outfit of Kwak Min-Jung from Korea. From this inspiring costume I created this card for my sister's birthday in April using the beautiful new Roses stamp set. Her favorite color is blue. I colored the rose and leaves with Koh-i-Noor coloured pencils , gamsol and paper stumps. I stamped and cut out the flower twice and layered it with foam dimensionals. The knit stitch circle border is stamped in black and versamark and then I sprinkled Dazzling Diamonds over it -and yes I am now all glittery as well as my work table! Next on the hop is Lisa! But Wait!!! MORE FUN NEWS:!! 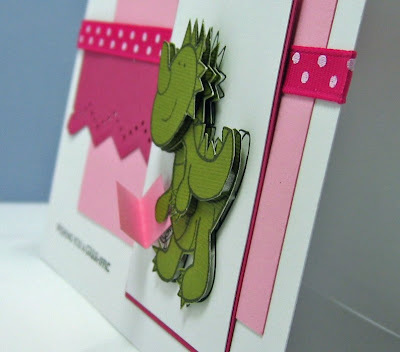 This month there's another way to win a WMS stamp set - check out the WMS sponsored color challenge at Stamping Around - add your card to Mr Linky over there for a chance to win Spring Baskets!! whoo hoo!! Another fun inspiring web site called Lark for the Inspiration challenge over at Split Coast today. 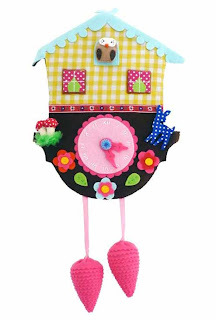 I chose one of Stef's samples - this cute cuckoo clock for my inspiration. I loved the bright colors and fanciful look of it! I made my round card with a scalloped circle nestability, sponged the edges with ink and sponged my clouds with my home made cloud template. See my tutorial on making clouds here. 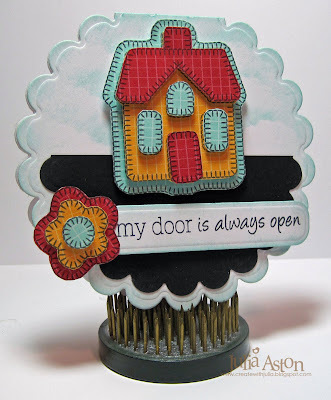 My house, flower and sentiment are from the Sewing Box Hugs stamp set by Waltzingmouse Stamps I stamped both the house and flower multiple times on different colors of Bitty Box Basics DP by PTI, cut out the pieces and layered them with foam dimensionals for a fun paper tole look. Are you planning on joining us on the Customer Waltzingmouse Blog hop on Monday? If you are - hop on over right now to sign up on Mr. Linky!! My card today covers 3 challenges! 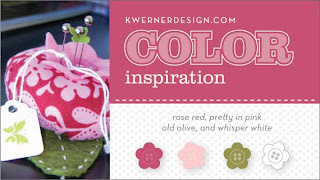 The sketch challenge over at Split Coast, KWernerDesign color challenge as shown above, and the #11 Holiday extravaganza challenge at Split Coast to use Papertole on your card. I layered the dragon 3 times - the initial stamping on white, then the whole thing on green - cut out and layered over the stamping with foam dimensionals - then stamped and cut out the arm/back/head and layered it - then stamped and cut just the head and layered it. You can see the layers better on this side view here. It's a fun technique and really adds dimension to your stamped image! This cute little dragon holding his own little card (there is a stamped card in his hand - but I added this real little card!) is from H&M Stamps My Favorite Velentine set . We've just had a snowstorm here today - leaving about 8" of the fluffy white stuff! Happy New Year Everyone! All of you bloggers have made this past year an exciting happy one for me and I look forward to continuing our friendships into 2009!! Hope you are all having a great Saturday - getting all your errands done or chores around the house - I've been happy as a clam getting some stamping done in my studio. This fun little card (actually it's a big card - 5" x 5" !) 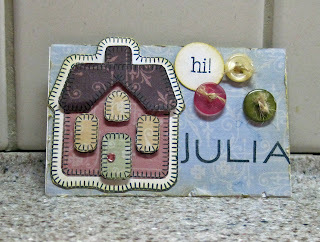 was made for todays inspiration challenge - to be inspired by a scrapbook page in honor of National Scrapbooking Day. 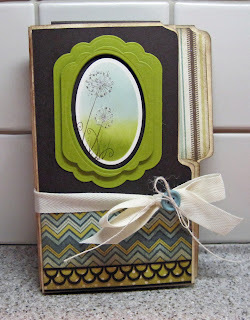 I am a scrapbooker - but wasn't too enthused about this challenge - make a card from a page?? Didn't really float my boat if you KWIM? but then I browsed the Split Coast Scrapbooking forums where I have never wandered before and found this fun page by Jennie to be inspired by. 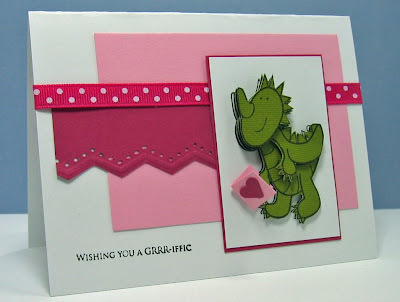 I chose this one because I had this wonderful sheet of DP from Making Memories with the stamp edge that I bought quite some time ago and then couldn't quite figure out how to use it on a card! So here was the perfect opportunity - I thought it would make a good substitute for the round edges on the inspiration page. I colored my cute little girl from Whipper Snapper Designs that I got from Addicted to Rubber Stamps (one of my FAVORITE stamp websites - they have everything! see my side bar for a direct link to them) with Prismacolor markers and added the fun dotted primas. 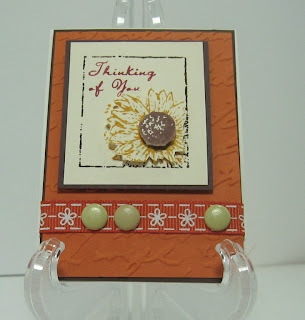 The sentiment is by PapertreyInk Beautiful Blooms set. So I ended up really enjoying this challenge! Sometimes when we go where we don't think we want to we find great inspiration! Several days ago I mentioned that I would be loading up some ATC's (Artist Trading Cards). Finally got the chance to do it! 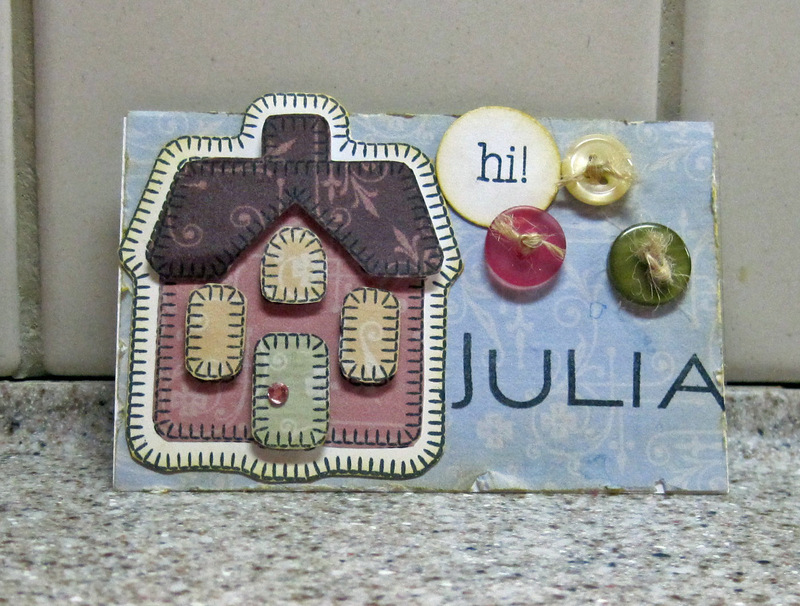 I was invited by MissHelenStamps on SCS to participate in a monthly ATC swap with her. 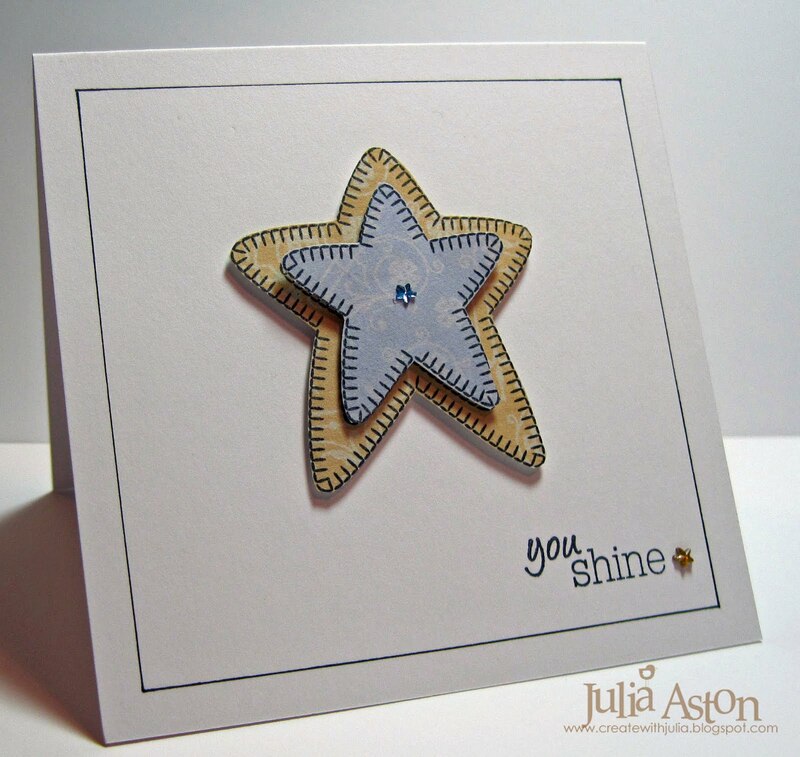 I had only made a couple of these cute little 2 1/2 x 3 1/2 cards before during Virtual Stamping Weekend challenges on SCS so I thought this would be fun! Each month one of us decides what the topic will be. 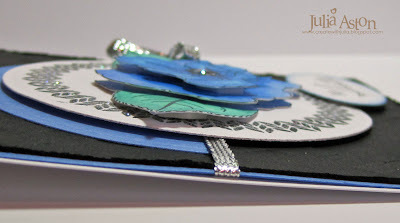 ATC's are a fun way to make a quick card design since there is not a lot of space to cover - and can be used to inspire a larger card at a later date. There are many people that swap these with large groups. Craft stores sell special round racks to hang and display them on. For now - I'm happy swapping with just Helen! Here are 3 that I have made so far. 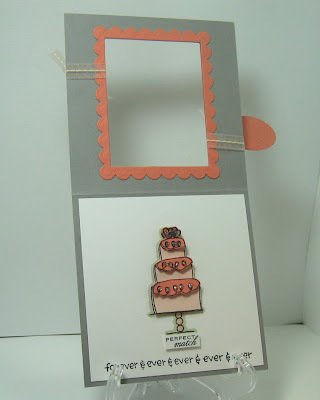 And here is a card I made later using the design from the ATC on the card. This one was to use an animal on your ATC. I used my cute Riley Stamp! We had to use a flower on this ATC. I used the Paper Tole technique layering the pieces over the stamped flower. Stamp: Measure of Life- SU, Paper: choc chip, pumpkin pie, very vanilla. Su markers, cuttlebug script folder. Ribbon, brads. I made this Halloween ATC during an SCS Virtual Stamping Weekend for a 'Make An ATC' challenge. Stamp: Close to my Heart, Prismacolor markers, ticket corner punch, bat eyelets, orange eyelets, stitched ribbon, ticket corner punch. Paper: Black, white. So there you have the sum of my ATC experience so far! 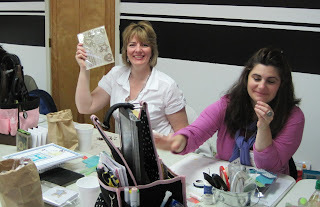 For May - Helen and I are making an ATC using only Black and White colors. I'll post mine after I've made it! Have a great Saturday - Kent and I are off to the Melrose Symphony tonight with some friends - It's quite a professional group with a really congenial Conducter who always has a joke for the audience sometime during the performance! Today's thought from Poor Richard's Almanac: "Great beauty, great strength, and great riches are really and truly of no great use; a right heart exceeds all." I am part of a group of 9 friends who have connected on Split Coast Stampers and each week one of us issues a Double Dare challenge. 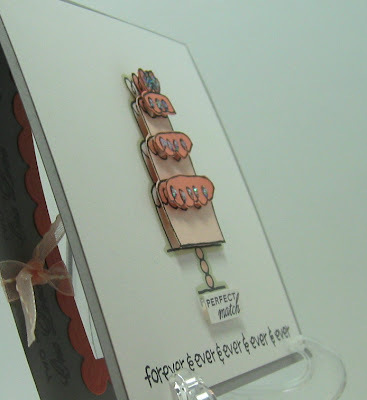 This week Joan (Joan Ervin) Double Dared us to make a soft, beautiful, elegant wedding card. I cut the opening on the front of the card with my square nestability. Then I cut a slightly larger scalloped square out of Groovy Guava and cut out the middle with the regular square I used on the card front. I attached the frame over the opening. 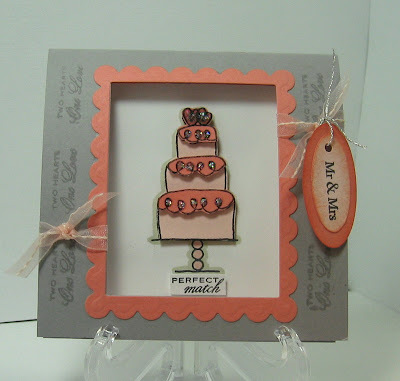 I stamped the cake on a white panel attached inside the card and then on a Blush Blossom piece and again on a Groovy Guava piece. I cut the Blush Blossom cake out and layered it onto the white panel using foam dimensionals. Then I cut each layer of frosting out of the Groovy Guava piece and layered that on top of the blush layer, again using dimensionals. This is the paper tole technique that we used in a recent challenge over on split coast (scroll down to my March 31st posting). I stamped the sentiment "two hearts one love" from the Papertrey Favor It Wedding set, around the frame with Versamark ink - so it's a watermark rather than a color. And I put diamond stickles on the frosting and hearts to add a little sparkle! Inside the card underneath 'perfect match' I stamped 'forever + ever+ever+ever+ever (Hampton Arts). I hope that doesn't scare the bride and/or groom!!! LOL!! Here you can see a close up side view of the Paper tole layering of the cut pieces of the cake. Today's challenge over at Split Coast was to use Paper Tole - where you stamp your image several times - cut out the main features and stack them one on top of the other to create depth. I took pictures of the process as I made my card so that you could see how it was done. Here is the finished product - where I layered the top of the outfit twice, and the pants once. I then added another layer of the cuffs and pockets . First, I stamped my image by Lockhart Stamps 3 times on vanilla card stock. 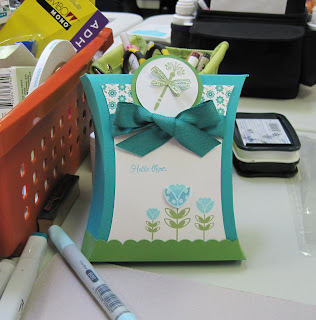 Then I colored in all three images with my Stampin Up Sage Shadow marker. Next, I cut out 2 of my images, separating the top and bottom of the outfit. You can see my small detail scissors that I used. I highly recommend getting small scissors for cutting out small items. It is much easier to cut around the small angles and pieces with them. Note: When I was done - I decided to add a top layer of pockets - so I stamped my outfit another time on a piece of vanilla cs and colored it in and cut out the pockets. Here you can see that I cut the cuffs off one pair of pants and put the dimensional foam pieces on the back of two tops, one pair of pants and one set of cuffs. I didn't use the other piece of pants. 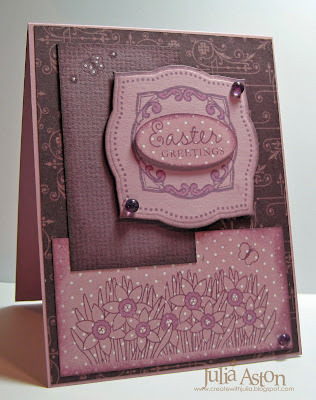 Then I removed the backings on the dimensionals (I use Stampin Up Dimensionals - I find them to be the best) and attached them over the first stamping. You can see all my layers here on this side view. This is when I decided it would look better to add another layer of pockets. Here it is finished - with all the layers of designer paper and card stock. I punched the corners of the image and panel with my corner punch. I also doodled the edges of the image as well as the card, added the ribbon and heated it with my hot gun to curl it. The instructions for the challenge said that this is easy - it just requires patience and good cutting skills - and they were right. But the outcome is well worth the effort - don't you think? I love the look of this dimensional card and I'm sure that I'll try it with other images. And each time I try it - I'll get better at cutting out the small pieces! 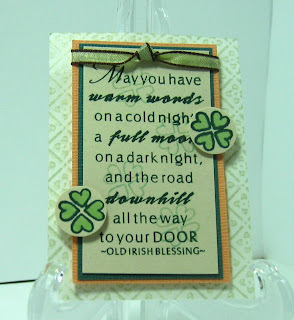 Thanks so much for coming by to see my card - have a great night and see you tomorrow!